It’s that time, again! The end of 2011 is in sight, and many businesses are frantically trying to cross off the last few items on their 2011 checklist before New Years. This year, Panel Built would like to help. If you need a modular building system delivered by the end of the year, a Panel Built 2-Day Quick Ship building is the solution. Shipped within 48 hours from receipt of the purchase order, an in-plant modular building system from Panel Built is a quick and affordable solution for your company’s space needs. 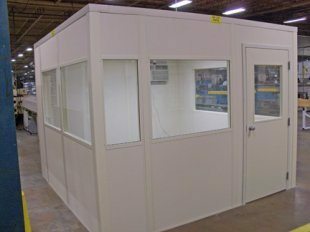 Available in 8’ and 10’ panel heights, with standard windows, HVAC, and electrical components included; an in plant 2-Day Quick Ship modular system comes with all materials needed to construct your new office, break room, or machine enclosure. Best of all, with a Panel Built 2-Day Quick Ship system, there is little to no construction debris. Everything is pre-fabricated. Simply receive the package and start assembling! For more information on a Panel Built 2-Day Quick Ship modular in-plant office system, please call 1-800-636-3873.